Senior Frank Cimato won a 9-3 decision in his final home bout as a Dragon against Rutgers University senior Trevor Melde at 141. 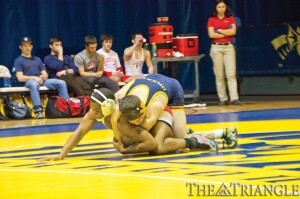 The win earned Drexel three points for the match, but the team lost by a final score of 26-10 to the Scarlet Knights. The Drexel University wrestling team struggled Feb. 15 against Rutgers University in its final home dual of the season at the Daskalakis Athletic Center. Rutgers spoiled Drexel’s Senior Night by defeating the Dragons 26-10. With the defeat, Drexel fell to 8-11 overall on the season while the Scarlet Knights improved to 16-3. The dual started off with Rutgers earning a win-by-fall at 285 to jump out to an early 6-0 lead. Jacob Goodwin followed the loss with a hard-fought match at 125 but could not pull out the win against Rutgers’ Joseph Langel III, who took a 7-3 decision. The Scarlet Knights won the next match in decisive fashion, earning a major decision at 133 to widen their lead to 13-0. Senior Frank Cimato put the Dragons on the board with an impressive 9-3 decision over Rutgers’ Trevor Melde at 141 to put the score at 13-3. With the victory, Cimato put an exclamation point on his last match at the DAC. “That was a great win for Frank over a ranked opponent in the last home match of his career,” head coach Matt Azevedo said of his team captain’s performance. Senior Joshua Yurasits followed Cimato’s performance with a strong effort of his own at 149 but eventually fell 10-7 to the Scarlet Knights’ Ken Theobold. The win gave Rutgers a 16-3 advantage. At 157, Noel Blanco had one of the strongest performances of the night, earning a major decision over Mikey Simmons. The Scarlet Knights quickly squashed the Dragons’ hopes of a comeback by taking the next three matches at 165, 174 and 184 to take a commanding 26-7 lead. Brandon Palik ended the night on a positive note with a 4-0 decision at 197. Despite the loss, Azevedo believes there were some positives in the dual. Prior to the dual, four Drexel seniors were honored for Senior Night, including Cimato, Yurasits, Charles Aungst and Jack Callender. The Dragons will be back on the mats Sunday, Feb. 24, when they will head to the University of Pennsylvania for their final dual of their regular season. The Quakers currently hold an 8-3 overall record and will be a tough challenge for the Dragons. Despite their most recent loss, Azevedo likes the direction his team is headed in going into the last match of the season and toward the Colonial Athletic Association Championships.